Emily Blackwell (October 8, 1826 – September 7, 1910) was the second woman to earn a medical degree at what is now Case Western Reserve University, and the third woman (after Elizabeth Blackwell and Lydia Folger Fowler) to earn a medical degree in the United States. In 1993, she was inducted into the National Women's Hall of Fame. Blackwell was born on October 8, 1826 in Bristol, England. In 1832 the family emigrated to the US, and in 1837 settled near Cincinnati, Ohio. Inspired by the example of her older sister, Elizabeth, she applied to study medicine in Geneva, New York, where her sister graduated from in 1849, but was rejected. She was then accepted to Rush Medical College for a year but the state medical society censured the college and she was only able to attend one semester. 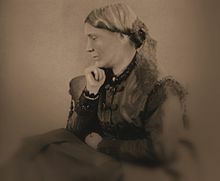 Eventually, she was accepted to the Medical College of Cleveland, Ohio, Medical Branch of Western Reserve University, earning her degree in 1854. 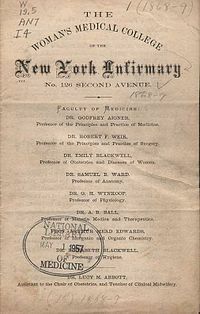 In 1857 the Blackwell sisters and Marie Zakrzewska established the New York Infirmary for Indigent Women and Children. From the beginning Emily took responsibility for management of the infirmary and in large part for the raising of funds. For the next forty years she managed the infirmary, overseeing surgery, nursing, and bookkeeping. Blackwell traveled to Albany to convince the legislature to provide the hospital with funds that would ensure long-term financial stability. She transformed an institution housed in a rented, sixteen-room house into a fully fledged hospital. By 1874 the infirmary served over 7,000 patients annually. During the American Civil War, Blackwell helped organize the Women's Central Association of Relief, which selected and trained nurses for service in the war. Emily and Elizabeth Blackwell and Mary Livermore also played an important role in the development of the United States Sanitary Commission. ^ "Dr. Emily Blackwell." Retrieved: October 23, 2013. ^ Kelly, Howard A.; Burrage, Walter L., eds. (1920). "Blackwell, Emily" . American Medical Biographies . Baltimore: The Norman, Remington Company. ^ Faderman, Lillian (2000). To Believe in Women. Mariner Books. pp. 6, 289–290. ISBN 978-0-618-05697-2. ^ "Dr. Emily Blackwell Dead" (PDF). The New York Times. September 9, 1910. Retrieved 2007-06-21. One of Founders of First Women's Hospital In America. Blackwell, Emily. "Blackwell, Emily". American National Biography Online. Oxford University Press. Retrieved March 25, 2017.